-Texas politics: "Well, our attorney general is under indictment. He ran as 'the people's lawyer'; now we call him 'the people's felon.'" -The flag burning debate: "Bush's last birthday cake was in the form of the American flag, and he ate it—stars, stripes, and all. Think about where that flag wound up—I call that desecration." -Beign a woman in Texas: "There are several strains of Texas culture: They are all rotten for women... One not infrequently sees cars or trucks sporting the bumper sticker "Have fun—beat the hell out of someone you love." 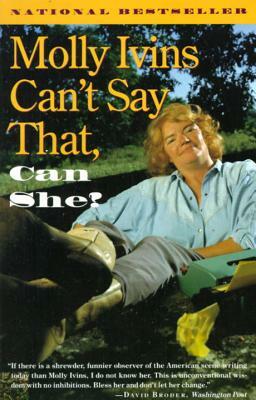 Molly Ivins was born and raised in Texas. She has been a journalist for more than twenty years and has written for the Texas Observer, The New York Times, Time, and many other national magazines. She has appeared on the Mac-Neil/Lehrer News Hour, Nightline, The Tonight Show, and Today. She currently lives in Austin, Texas, and writes a nationally syndicated column for the Fort Worth Star. "Molly Ivins has birthed a book and it is more fun than riding a mechanical bull and almost as dangerous. "- Ann Richards, governor of Texas.